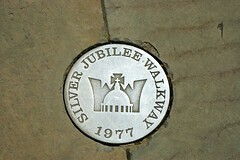 Developed for the Queen’s Silver Jubilee in 1977 and refurbished for the Golden Jubilee. The walk features silver and golden discs and panoramic panels with information along the route, highlighting much of the best that central London has to offer. A great way to explore London is to walk the route and make a photo diary of it. Just follow the discs on the ground and look out for the panels and other markers too (take some shots of them also! ).